Hello friends! 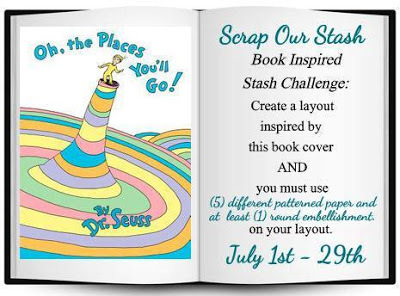 I'm thrilled to be part of SCRAP OUR STASH amazing tem! Challenges are fun and full of inspiration! Please join us! 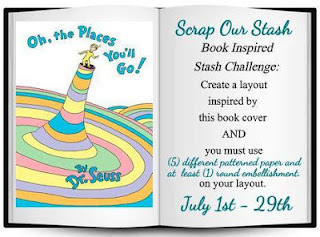 "I was inspired by the stripes on the book cover and immediately know witch photo I will use for this challenge. My round embellishment is a die cut from The Cut Shoppe. I just added a few more embellies and title." into our random prize drawing for July. Beautiful layout, Carmen and such an amazing take on the challenge! I love it!